The Exploitation Company of the Eiffel Tower is the organization that manages the Eiffel Tower on a daily basis. If its current form is recent, it is from its construction of Gustave Eiffel decided to create a society of exploitation, not feeling able to take care of itself of its monument from a commercial point of view. He was aware of being a builder, not an operator, so that's why he created, even though the tower was not completed, in 1889, this company. By the end of the year 1888, the erection of the Tower was almost complete and only a few of the upper panels and the crowning were missing. All the difficulties were thus overcome, and I was sure of arriving, without any appreciable delay, for the final completion. Also, wishing to spare myself the concerns of surveillance of an exploitation which did not return in my habits of builder, I resolved to found a Special Society which would take care of this and to which I would return the work carried out, as well as the rights granted to me by my concession. The universal success of curiosity already gained by the Tower during its execution was a sure guarantee that it should be, during the Exhibition, extremely visited, and considered as an affair, it must have been an excellent one. operation for the Company which would be responsible for its operation. I also wanted, and in the most essential way, that my contributions were not subject to any of the increases that often occur in cases of this kind. So I evaluated in the most moderate way the expenses that remained to be done, and I bore the full price of the Tower and its accessories, as described in the Concession Act, at a very low figure of 6. 500,000 francs. As I had to receive 1,500,000 francs of State subsidy, the work carried out represented only the complement, that is to say a sum of 5,000,000 francs, and it is to this sum that I had fixed the capital of the Company to be formed. We have already seen that in fact the expenses exceeded my forecasts and amounted to 7,392,502.97 francs, ie a surplus of 892,302.97 francs. This unforeseen event, to which I had not given a large share, was due to a thousand details of installation which it was very difficult to be aware of in advance, and it was the Company that benefited from it. In addition, I did not want to reserve any part of the profit before the first shareholders were fully repaid. Mr. Eiffel brings to the Company the right to enjoy the exploitation of the Eiffel Tower during the year of the Exhibition and for the next twenty years, as this right was granted to him by the agreement of January 8, 1887 with the State. He undertakes to complete the complete installation of the Tower and its accessories, as defined by the agreement with the State, within the deadlines and conditions set by the said conventions. These buildings and installations will be made by Mr. Eiffel of his money, including the sum allocated to him on the credits of the Exhibition. Mr. Eiffel reserves, during all the duration of the exploitation, the exclusive enjoyment of the upper part of the Tower, outside the part accessible to the public, on the understanding that this enjoyment can not do for him the object of no profit in money. The social fund is set at 5,100,000 francs divided into 10,200 shares of 500 francs each. 50% for shareholders and 50% for Mr. Eiffel or his successors. These 50% of the profits attributed to Mr. Eiffel may be divided into shares el represented by securities, the number, form and mode of transmission will be fixed by the first Board of Directors of the Company . Their number was determined equal to the number of shares, ie 10,200. It follows from these stipulations that, since the original capital has been repaid in full in the first year and the number of participating shares replacing the former having remained of 10,200, the following profits are divided equally between the shares of enjoyment and the beneficiary shares. The Company was definitively constituted on March 4th, 1889, and the first Board of Directors was composed as follows: MM. G. Eiffel, President; Couder, Honorary Director General of Public Accounting; Gabriel Thomas, Managing Director; Prègre (Arthur), Director of the Fould-Dupont House, Paris; Salles (Adolphe), Engineer, Managing Director of Compagnie des Établissements Eiffel. Commissioners: MM. Charton (Jules); E. Trowel; Moses Dreyfus. As this new company is created, it starts in its first year with revenues and expenses. Here is the detail of each gain and loss of this first year, during which took place the world exhibition of 1889. To burn the stages, know that the receipts amounted to 6 523 847,40 francs, the expenses to 972 810 , 93 francs for a net profit of 5,551,036.47 francs having been used for 5,100,000 francs to repay the share capital. This company has been profitable since the first year. There were various sources of revenue for the operation of the Eiffel Tower during the World Expo. This table summarizes them. You have in the rest of this page the details of each part. It should be noted that the report of the official Board of Directors of the time brings the total revenue to 6,687,893.40 francs. This is because there is firstly a sum of 100,000 francs for cash payments on 200 shares and secondly the sum of 64,046 francs paid to the Exhibition and carried as expenses. 1st floor until 27 May, date of commissioning of Combaluzier lifts. On the 2nd floor until June 4, the date of commissioning of one of the Otis elevators; the second was delivered on June 22. Finally, since the Edoux lift was not put into service until June 13, it was not possible until that date to climb to the top. The entrance fees of the monument, during the exhibition, were, during the week: 2 francs for the 1st floor, 3 for the 2nd and 5 for the 3rd. From November 7th, the day after the closing of the Exhibition, the entrance fee for the 1st floor was reduced to 1 fr and that of the total climb to 4 fr. For the Sundays and public holidays, the prices fixed by the specifications of the concession were: 50 cents for the 1st floor, 1 francs for the 2nd and 4 francs for the 3rd. These prices were collected for only one day, Sunday, June 16; but the influx of visitors was such that it inspired fears in the Administration of the Exposition, which had to agree, in order to prevent the disorder resulting from this influx, to double the price of 2 fr primitively fixed, provided that the benefit resulting from this measure would be shared between the said Administration and the Société de la Tour. As a result, the prices of Sundays and feasts were fixed in the following manner: 1 francs the 1st floor, 2 francs the 2nd floor and 4 francs the 3 floor. These awards were only received from 11 am to 6 pm Outside these hours, the normal price of the week applied. These numbers can be broken down differently: 685 057 visitors stopping on the 1st floor, 703 846 on the 2nd floor and 579 384 on the 3rd floor, making a total of 1 968 287 visitors. The most productive month was September, when the number of visitors reached 409,793, giving an average of 13,600 visitors per day. This influx of visitors was facilitated by the exceptionally good weather that prevailed, except in May, generally during the entire Exposition. From May 15 to November 2, 72 beautiful days were recorded, 57 uncertain, 42 bad ones due to rain or wind, so that, over 171 days, there were only one quarter during which climbs were more or less partially upset. 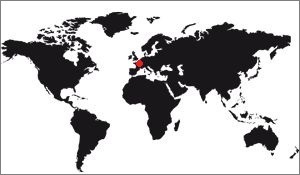 The average product of a visitor is 3 francs. and is equivalent to that of a visitor stopping at the 2nd platform. A direct service was organized to climb without stopping the ground at the 2nd platform. - The number of travelers who benefited was 294,001 out of 1,283,230, or about 23%. We give the table that provides the statement of revenue for each week. The two largest daily receipts are those of Monday, September 9 for 6o 756 fr and Monday, September 16 for 59 457 fr. Weekly earnings, which were highest, are those of the 18th week (11 to 17 September) for 349,796.50 francs, an average of 49,971 francs per day, and that of the 17th week (4 to 10 September) for 343,722 francs. , 50 fr, an average of 49.103 fr per day. The general average per week, from May 15th to November 5th, was 233,812.74 francs, which gives an average of 33,400 francs a day. We see that it was the months of June and September that gave rise to the highest revenues. The proceeds from vending machines amounted to 9,848.35 francs, still for the period of the 1889 World Fair. The sale of objects that did not result in concessions was made by the Company, which purchased the items from suppliers and sold them directly to the public. The prices of the purchased items being 42,130.95 francs and the gross proceeds of the sales made to the public amounting to 63,572.15 francs results for the Company a net profit of 21,441.20 francs. The cost of office supplies was 9,569.85 francs. As in all companies certain expenses do not fit into a specific category, hence "miscellaneous expenses" amounting to 7 170.26 francs. The compensation awarded to the staff employed in the sweeping and, outside the regular hours, the removal of the garbage (1,404 m2 2 fr), as well as the utensils gave an expense 16,032.95 francs, less reimbursement by the concessionaires of 2,073.00 francs. The sweep cost was therefore 13,959.95 francs. 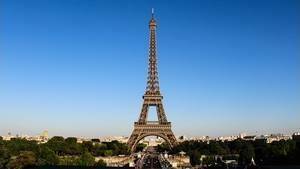 Including a sum of 5 000 francs for renting Pasquier Street offices, and a sum of 1.000 francs for renting the site of the Tower at the Champ de Mars, this chapter amounted to 9,244.45 francs. Gas and electricity lighting costs amounted to CHF 12,046.75, of which CHF 6,653.00 was deducted from restaurants, giving a net rest of 5,595 francs, 75 francs. Indemnities, subscriptions and donations: 2,318.75 francs. These benefits apply mainly to clothing damage. Collecting equipment: 7 868.25 francs. These are supplies of tickets at 1.75 francs per thousand, as well as the pliers to be punched. 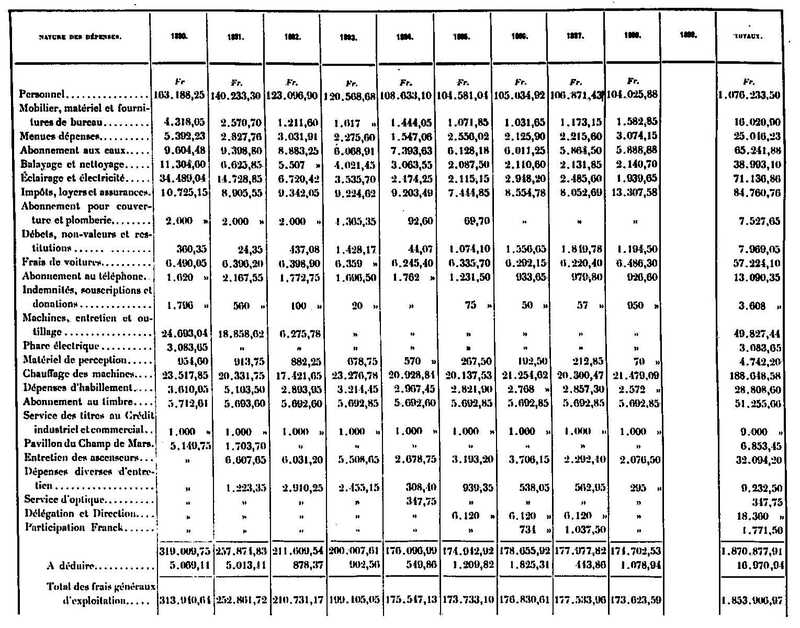 The total operating expenses for the duration of the universal exhibition is therefore 452 529.01 francs, to which must be deducted the cost of transporting the goods by the elevators reimbursed by the concessionaires (7 248 francs) and the fines and accidental receipts (2,304.20 francs). The total expenditure for this period was therefore 442 976.81 francs. To this figure should be added advertising (110 215 francs), nettenien of machinery and equipment (52 627.39 francs), agio on Treasury bonds (3 875 francs) and the Board of Directors and Auditor (30,000 francs + 3,000 francs). Finally, there were still various things to be paid: 14,099.40 francs in the company's constitution, 35,626.85 francs in furniture and equipment, 31,966.15 francs in machinery, maintenance and tools, 271,437.08 in installation and fittings, 72,426.90 of electric lights, and 4,526.90 francs of collection equipment, less 100,000 francs of current extimation. All these costs are depreciated, that makes a total of 330,116.73 francs. These figures are given to us at the best source ever, it is Gustave Eiffel who published the result of exploitation of his tower between 1890 and 1898. Here, year after year, the table recapitulating the number of ascension thus as revenue from various categories. As a result of this table, during the nine years following the Exhibition, the number of visitors was 2,312,095, an average of 256,900 per year. The total revenue during the same period was 4 668 406.88 francs, an average revenue of 518 500 francs a year. 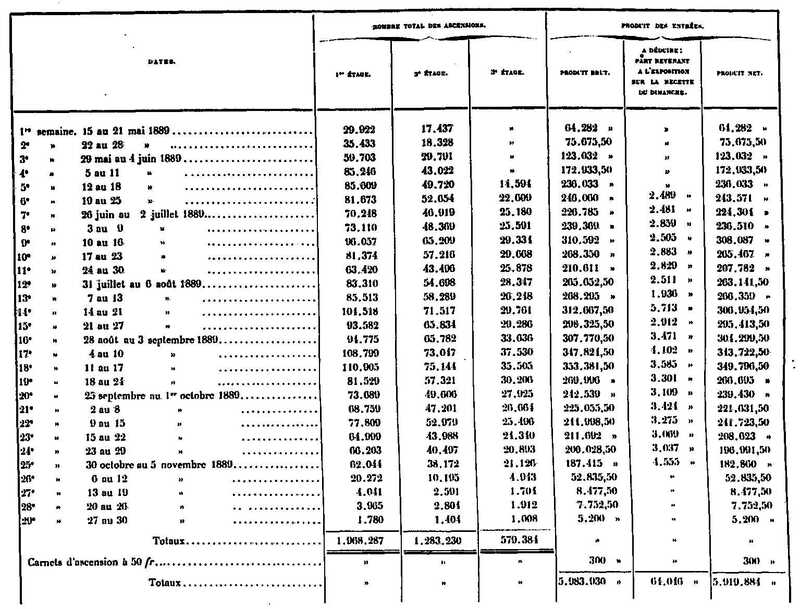 Here is the table of general operating expenses, which is detailed as it was done for the year 1889. The general expenses of the farm have thus been constantly decreasing from 313,940.64 francs to 173,623.59 francs; this figure seems to be the lower limit of these. The total for the nine years is 1,853,906.97 francs, or an average of 206,000 francs per year. But, apart from the general operating expenses, there are certain categories of expenses, such as those for new constructions or transformations of the old ones (especially the village hall), as well as the expenses of the Board of Directors, which each year significantly reduce the share available on the difference of the sums shown in the tables above. Dividends actually distributed, as well as funds set aside as statutory reserves and contingency funds, are summarized in the table below.